One of my favorite Boostrap plugins is dropdowns, but I had a bit of difficulty getting started with them. The docs say you can apply a jq-dropdown to nearly any element, but they really seem to work best with Bootstrap’s navbar, tab, and pill components. Since I was retrofitting an app that was around long before Bootstrap, this wasn’t going to work for me. 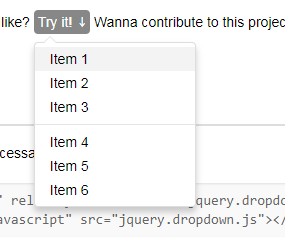 That and I was hoping to get a scrollable jq-dropdown (with tips!) and a few other features out of the deal. Thus, this plugin was born.